In season 1 episode 12, Luke and Ryan are paired up to work on a science project together. That project involved going to Luke's dads dealership to use the dealerships special printers and copiers. While Ryan and Luke check out cars, they see lukes dad and another man. Luke then looks like he saw a ghost when he sees his dad making out with that man. 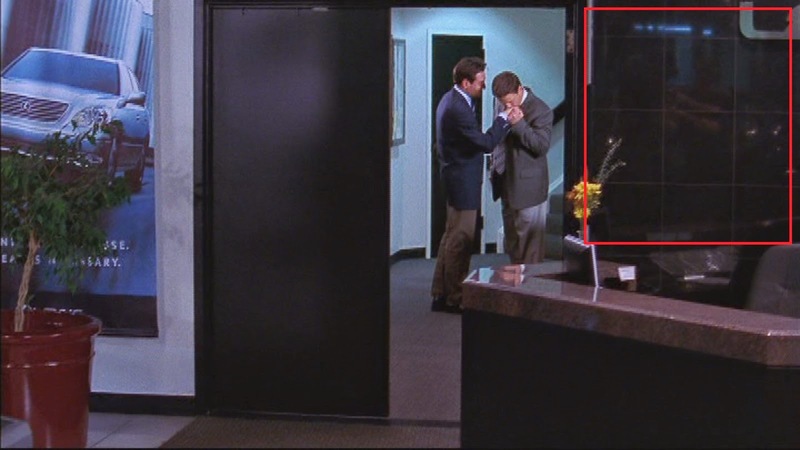 GOOF: Look at the photo and the portion inside the red square - during this scene there is a wall made of reflective marble (probably not the best choice), for a split second you can then see a camera man and along with the camera shooting the famous make-out dad's out the closet scene. Poor Luke, can't say it gets much better from here..
Where to find it: Season 1 Episode 12 "The Secret"